Our privately chartered ship, the M/V Natural Habitat Ursus, provides accommodations for up to eight guests on our exclusive grizzly bear adventures on the Alaska Peninsula. Ideally designed for exploring the remote waters of coastal Katmai National Park, the Ursus (Latin nomenclature for "bear") is 73 feet long with a deep displacement hull and an exceptionally seaworthy design with a high bow and fine horseshoe-shaped stern. It carries a full complement of state-of-the-art navigation and safety equipment. Inside, the sturdy vessel is intimate and simply appointed, yet with ample space and facilities for accommodations and activities. The Ursus sleeps eight guests in four double cabins with upper/lower berths. Each cabin has a wash basin. Two bathrooms with toilet and shower are shared between the four cabins; each bathroom is connected to two cabins in a Jack and Jill layout. A large galley and well-lit dining space are the site for convivial conversation over creative home-cooked meals prepared each day by our accomplished onboard chef. Fresh Alaskan seafood, including halibut, salmon and Kodiak scallops, highlights many of the dinners. The ship also has a small library, computer, DVD and CD player on board, with a selection of regional books and documentaries. Ursus was originally built in 1984 as a crab fishing boat called the Time Bandit, which plied the stormy waters of the Bering Sea. 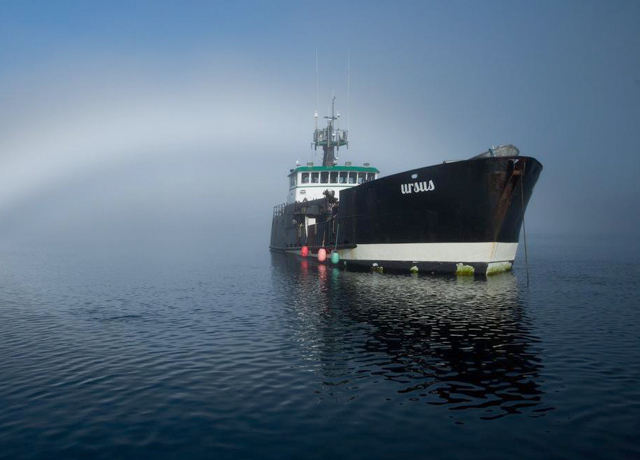 Its successor, the newer Time Bandit, gained fame in the Discovery Channel TV series "Deadliest Catch." In 1989 the original Time Bandit (now the Ursus) was transitioned for research use by the National Park Service, Alaska Department of Fish and Game, and other agencies conducting scientific study and monitoring. It has since been retrofitted and comfortably appointed for custom marine charter use. In addition to our grizzly adventures, the ship has outfitted two international filmmaking projects, the 2012 BBC/Discovery Channel documentary Great Bear Stakeout, and an NHK (Japanese public television) program on orcas hunting gray whales and humpbacks. With Ursus providing our accommodations offshore, we are able to visit some of the world's most pristine wilderness in Katmai National Park in exceptional solitude without leaving an impact. The central element of this adventure is our shore excursions to see the bears on foot. We transfer from the Ursus to the beach in an open aluminum skiff carried on board. We frequently make wet landings (just offshore in the intertidal area, where we may walk in water to our knees), but chest waders with waterproof neoprene booties are provided to keep your feet dry. Ocean tides of up to 28 feet, some of the biggest tides in the world, erase most of the human tracks daily.